The world market for polyester staple fiber market presently houses market vendors that compete with each other even without the entry of any external market players. Product quality, credit terms, and price comprise the main parameters with which the market players compete. The market participants are making prolific efforts so as to ensure better position in the market. Substantial consumer base and customer loyal are important standpoints for the participants of this market. In an effort to retain both of these perks, the market participants are making an introduction of novel strategies like technical support post sales. In the years to come, the entry of new market players is anticipated to be restricted by the requirement for prolonged gestation periods and high capital. The market participants are projected to keep engaging in the core research and development work so as to devise novel services and products. The ability to convince the customers and keep them loyal to the company would play a crucial role in deciding the success of the various companies. A market research report by Transparency Market Research (TMR) forecasts the growth trajectory of the market over the period that extends from the year 2017 to the year 2025. The said market is anticipated to rise at a steady growth rate of 4.1% CAGR over the period of forecast. The market valuation of the said market stood at around US$ 23.167 bn in the year 2016 and is likely attain a figure of around US$ 34.546 bn by the end of the year 2025. A few of the key end-use segments in the world market for polyester staple fiber are personal care and hygiene, home furnishing, apparel, filtration, automotive, personal care and hygiene, construction amongst many others. Amongst them, the segment of apparel accounts for most of the demand. The said segment is estimated to have consumed 3365 kilo tons in the year 2016 and going forward it is anticipated to be the main factor that is driving the demand and raising the growth rate of 4.2% CAGR from the year 2017 to the year 2025. Apart from apparel, the segment of automotive and home furnishings is another key end-use segment in the world market for polyester staple fiber. On account of their durability and cost effectiveness, polyester staple fiber is finding another extensive application as car fabrics. They assist in keeping the cost of the automobile low also. Taking volume into consideration, the market share of the automotive is forecasted to remain 14% in the years to come. Polyester staple fiber is also witnessing major uptake from home furnishings. They are put to use as a filling material in soft toys, sofas, and pillows. They provide resilience and firmness. The category of home furnishing is anticipated to hold on to its share of around 14.5% in the years to come. From a geographical point of view, the region of Asia Pacific leads the said market with a dominant share. The regional growth is primarily backed by the commercial construction activities, increasing residential, increasing spending capacity of the people, and rapid urbanization, in Asia Pacific to hold substantial 41.4% of the market share in the world market for polyester staple fiber in the year 2016. A few of the prominent market players are W. Barnet GmbH & Co. KG, Indorama Ventures Public Company Limited, Alpek S.A.B. de C.V., China Petroleum & Chemical Corporation, Reliance Industries Limited, and Toray Industries Inc. The report estimates and forecasts the polyester staple fiber market on the global, regional, and country levels. The study provides forecast between 2017 and 2025 based on volume (Kilo Tons) and revenue (US$ Mn) with 2016 as the base year. The report comprises an exhaustive value chain analysis for each of the product segments. It provides a comprehensive view of the market. Value chain analysis also offers detailed information about value addition at each stage. 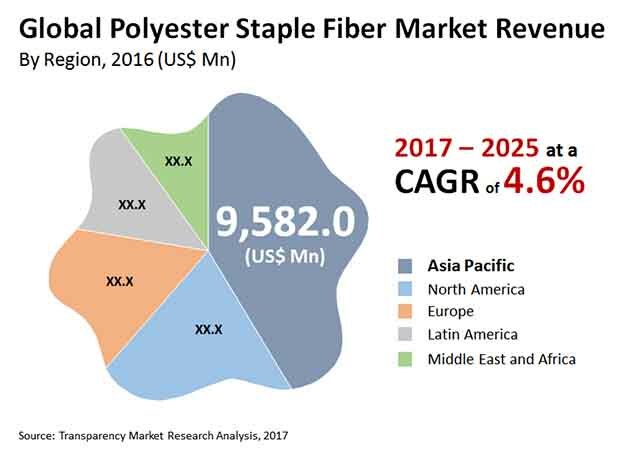 The study includes drivers and restraints for the polyester staple fiber market along with their impact on demand during the forecast period. The study also provides key market indicators affecting the growth of the market. The report analyzes opportunities in the polyester staple fiber market on the global and regional level. Drivers, restraints, and opportunities mentioned in the report are justified through quantitative and qualitative data. These have been verified through primary and secondary resources. The study provides a comprehensive view of the polyester staple fiber market by dividing it on the basis of end-use and geography segments. The polyester staple fiber market has been segmented into apparels, automotive, home furnishing, filtration, construction, personal care & hygiene and others based on application. Applications segment have been analyzed based on historic, present, and future trends. Regional segmentation includes the current and forecast demand for polyester staple fiber in North America, Europe, Asia Pacific, Latin America, and Middle East & Africa (MEA). Additionally, the report comprises country-level analysis in terms of volume and revenue for application segments. Key countries such as the U.S., Canada, Germany, France, the U.K., Spain, Italy, India, China, Japan, South Africa, Mexico, and Brazil have been included in the study. Market segmentation includes demand for individual applications in all the regions and countries. The report covers detailed competitive outlook that includes market share and profiles of key players operating in the global market. Key players profiled in the report includes Alpek S.A.B. de C.V., Indorama Ventures Public Company Limited, Toray Industries, Inc., China Petroleum & Chemical Corporation, Reliance Industries Limited, W. Barnet GmbH & Co. KG, Far Eastern New Century Corporation, Tongkun Group Zhejiang Hengsheng Chemical Fiber Co., Ltd., Zhejiang Hengyi Group Company Ltd., Jiangsu Sanfangxiang Group, ICI Pakistan Limited, XINDA Corp, Komal Fibres, Bombay Dyeing, Nirmal Fibres (P) Ltd., and Ganesha Ecosphere. Company profiles include attributes such as company overview, number of employees, brand overview, key competitors, business overview, business strategies, recent/key developments, acquisitions, and financial overview (wherever applicable).